Where does 40 years worth of detailed Corvette research by the experts in the Corvette Hobby go? The new editions are GREATLY expanded at 200+ pages and well worth the additional cost. 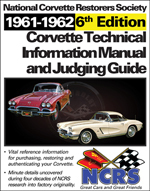 The 338 page 1961-1962 Tech Manual is NOW AVAILABLE! The 352 page 1956-1957 Tech Manual is NOW available! 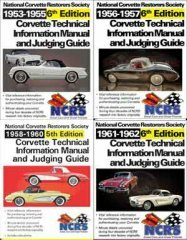 These are the single most helpful Corvette reference books available anywhere, period. Each one of the Technical Manuals is the result of thousands of hours of research by the most knowledgeable hobbyists in the country. They are the culmination of everything currently known about each model. Each one details PART-BY-PART how Corvettes appeared at the time of final assembly. Included are: finishes, part numbers, casting numbers, detailed descriptions, survey results, how to interpret date codes, and much much more. All are 8 1/2" x 11", and coil bound. They are a "Must Have". Already have a Manual? Check the cover to ensure that you've got the latest and best information. As new editions are published, we change the cover.